Pinterest is a social bookmarking site where users collect and share photos of their favorite events, interests and hobbies. It’s a perfect place for many online businesses. If your brand is offering visually stimulating products, you are already active on other social networks, you have time to post fresh content and your customers might be already there – you should start leveraging Pinterest. Start with the obvious – fill out the description on Pinterest. Upload your brand logo in a high quality. Add links to your website, Twitter and Facebook. Focus on the “About” section. It’s pretty much the same as meta description – it can contribute to the keyword-relevancy of your profile. Include info about your brand and what you are offering. When your account is ready you can move to the most crucial step – pinning items or products to your categorized boards. Make sure that description of items/products includes keywords. Thanks to that your pinned products and boards can be found through internal and external searches. Remember that Pinterest is a visual platform – using high quality photos is always a good choice. Pinterest has the power to drive high-value traffic and engage customers. These are the most important things you should keep in mind while using it. Consistent updating is highly recommended when you want to show your followers you are truly dedicated to your business. It will generate buzz and interest in your business, which can lead to sales and an increase in revenue. Studies show that Pinterest users are less likely to convert, BUT they tend to spend more. 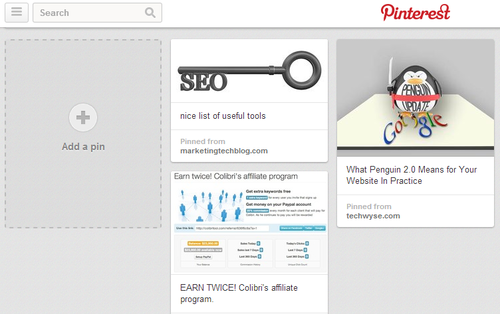 Pinterest represents a marketing channel for online retailers and brands. It’s capable of driving incremental revenue, improving SEO performance, and increasing brand awareness. Be sure to interact with other Pinners by leaving comments on other user’s pins, “liking” other user’s pins, mention pinners in your comments, following similar users or brands. I would like to present you the case of Dobango which by using Pinterest contest increased traffic by 167%. Dobango is a social gaming platform. The objective behind Dobango’s contest was to increase brand awareness around new gaming platform. So they asked participants to submit their favorite 4th of July images. Each participant had to create a Dobango account, submit entry, and follow Dobango on Pinterest. The participants had to encourage their friends and family to vote for their image via Pinterest’s “likes” on their pins. The winner got 250 likes. Dobango: “The contest was very successful. Even without investing any advertising dollars, we were able to generate over 5,000 user engagement activities over our entire social media presence. By user engagement activities, we mean the entire spectrum of activities related to the contest that require anything beyond reading about the contest. This includes entering, liking/voting, following Dobango on Pinterest and/or Facebook or Twitter, etc. There were 77 entries total. Though this may seem like a small number, the power of these entries spread by gaining votes and other points of influence.” Dobango admitted that Pinterest had jumped up to be their main traffic referrer.